Photo scanners can be a real lifesaver if you have a lot of print photos that you want to store on the computer or upload to a website. Many people are turning to photo scanners in order to preserve their old photo collections for generations to come. A typical photo scanner is smaller than a general purpose scanner but has a higher resolution, so it will digitally capture every detail of your photos. All the technical specifications can be difficult to understand, so we’ve put together this buying guide to make finding the right photo scanner easier for you. Photo scanners come in two distinct types: pass-through and flatbed. Their names refer to how you load the photo for scanning. There are also image, film, and negative scanners, which may utilize pass-through or flatbed design. Pass-through: Most photo scanners are pass-through models, which means that you feed the photos into the scanner and they pop out the other side. These models often come with a sheath, used to protect the photos in transit. Flatbed: Flatbed scanners are typically larger than pass-through models. They are more like general purpose scanners or copy machines, in that they require you to open the scanner’s lid, place the photo inside, and then close the lid for the scanning to take place. Image, Film, Negative: Image, film, and negative scanners come in pass-through and flatbed models. These scanners are able to not only create digital versions from actual photos, but also to recreate digital photos from film or negatives. DPI: DPI stands for dots per inch, referring to how many dots of ink are used to recreate each square inch of the photo. A higher DPI number means the photo will be clearer and have a higher resolution. Most photo scanners boast at least 300 DPI, but customer reviews say that an even higher DPI is better if you plan to crop or enlarge your photos. Extra Editing Features: Some of the best scanners come with software that allows you to edit your photo’s color, shading, and more. 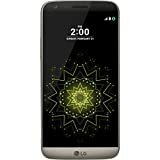 Tech-savvy customers who dabble in art and photography report that these features are important to them. Portability: Photo scanners come in a variety of sizes. 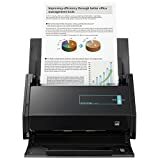 Many reviews state that finding a small scanner that can be used without a computer was important, so the buyer could take the scanner with them and scan photos in various locations (i.e. their attic, grandma’s house, etc.). Easy Set-up: Customers reported that they loved photo scanners with an easy set-up. Some scanners do not require any set-up work or installing any software on your computer; you can simply turn on the scanner and get started. Do you want your scanner to be hooked up to a computer? Some photo scanners work independently, scanning directly to a memory card, and photos can be uploaded to a computer later. This kind of scanner is useful if you’re going to be scanning in various locations. Other photo scanners are always attached to a computer and will show you your photos immediately as they’re scanned. On that note, how much storage will you need? Look for a scanner with a large memory card if you’re planning on scanning large batches of photos. If your photos are damaged or especially old, look for a photo scanner with Digital ICE or Digital Image Correction and Enhancement. This technology can restore color to faded photographs and even correct the appearance of creases or tears! How many photos you plan to scan might affect your choice. For the speediest scanning, look for a photo scanner without a protective sheath (or with an optional sheath) and with lower DPI. Scanning in higher resolution (higher DPI numbers) takes more time, though it also produces higher quality images. 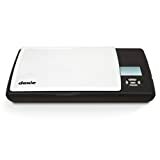 Similarly, a pass-through photo scanner with a sheath may take more time than an option without a sheath, since you’ll be loading and unloading photos from it. Think about what items you want to scan. If you have negatives and film to scan, make sure to get a photo scanner capable of turning those into digital images. If you have large photos, make sure your photo scanner can handle a variety of sizes. Kodak: Kodak has been a big name in photography practically since photography was invented. 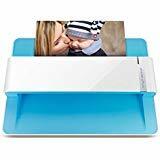 They make a variety of photo scanners, including some that can scan up to 85 photos in one minute, and they are known for their intuitive, easy-to-use photo-editing software. Epson: Epson launched their first mini-printer in 1968 and has been innovating in the printing industry ever since. 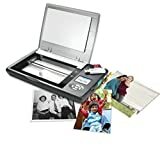 Their scanners can handle a variety of sizes and mediums, and they also offer a selection of top-quality photo paper, ink, and printers if you want to create new images from your old scanned photos.